Fall is here. Fi-na-lly. Seriously, this has been the longest summer I can ever remember in Seattle. So hot. Yes. I’m a heat complainer. Don’t worry, it’s actually a fairly normal condition in the Pacific Northwest. People don’t stay living round these parts for sunshine and sandy beaches. I love making pumpkin spiced deliciousness during the autumn months, but I’ll be honest, this recipe caught my eye over at Cooking Classy because of the chocolate. I don’t often see recipes pairing chocolate-y goodness with pumpkin, and I was interested to discover how they would complement each other. *Spoiler Alert – chocolate surrounded by a lightly spiced pumpkin cookie is an absolute winner! First of all, a couple hints about making perfectly formed, delicious looking cookies. I’m busting out all my secrets just for you. First, use a cookie scoop. This is absolutely essential if you want uniform cookies that cook at the same rate. 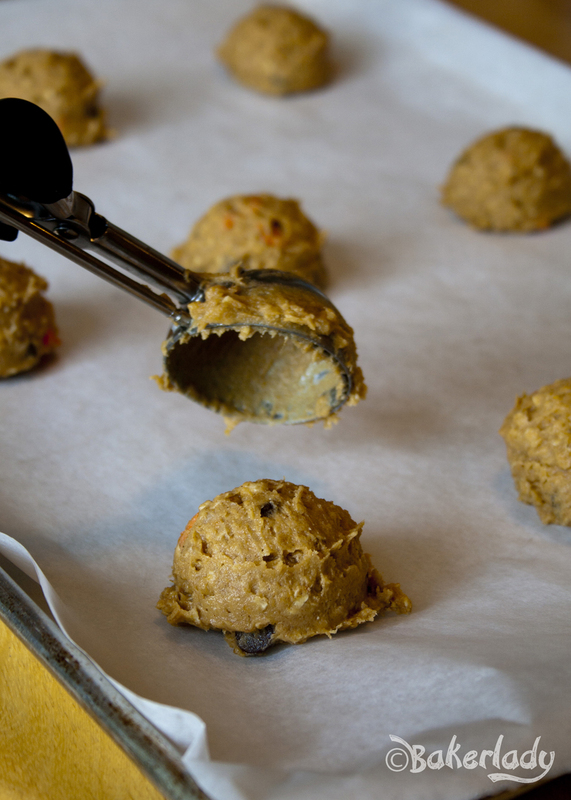 You could use your hands to scoop cookie balls like some kind of caveman, but aren’t we more civilized than that? I have cookie scoops in three sizes. In addition to making perfect cookies, I use them for truffles, cupcakes, filling mini-cheesecakes, and about four-hundred-seventeen other things around the kitchen. In a pinch, you can even use it as an ice-cream scoop. That is, if you are one of the few people who manages NOT to eat ice-cream directly from the carton. 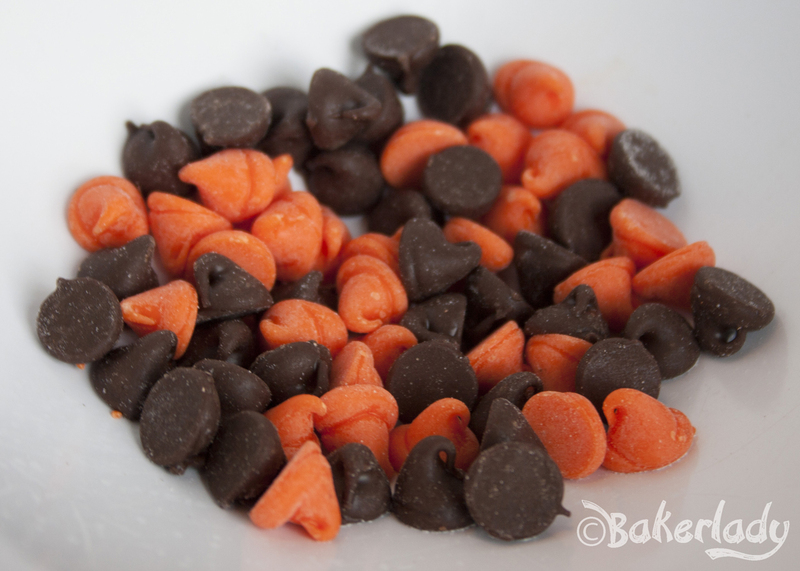 Secondly, save a few chocolate chips back from the batter when you’re mixing everything in during the recipe. I used these adorable black and orange fall morsels from Toll House. You should be able to find them in most grocery stores this time of year. Or you can just use regular semi-sweet chips. 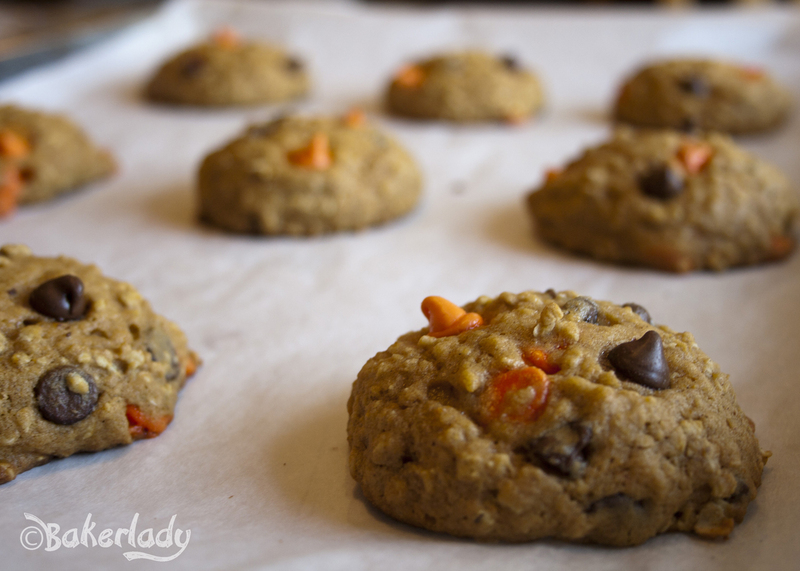 The cookies are a little orange-colored because of the pumpkin anyway, so you don’t really need the Halloween chocolate to get a great effect. But aren’t the little orange ones cute? Once you’ve scooped a cookie sheet full of perfectly rounded little cookie dough balls (using your fabulous scooper), stud the tops with a few of your reserved chocolate chips. Just press them lightly into the top. It’s like giving your cookies freckles. I’m sure you all already know…everything is better with freckles. When your cookies are done baking, there will be melty chocolate peeking from the top instead of just inside. See how there are little chocolatey nuggets poking out? That’s what you want to see. 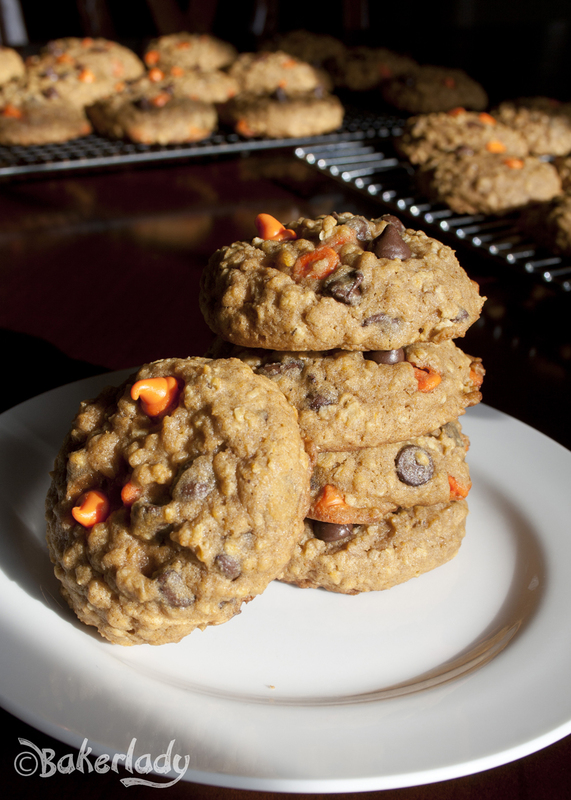 The addition of the oats makes these cookies deliciously flavorful and puffed when they come out of the oven. The pumpkin kind of soaks into the oats so it’s not a super pronounced pumpkin-y flavor. And, the texture is almost like a muffin. These actually reminded me of muffin top cookies, but without the fancy pan. These are gloriously soft and chewy cookies with a beautifully spiced aroma. The chocolate gives just the right richness and the oats provide a little bit of nutty flavor. If you want more nuttiness, you can add some pecans or walnuts, but I’m well-known for being anti-nut, so I didn’t include them. I’ve yet to regret the decision to keep nuts away from my pillowy baked goods. Mmmmmm these are a perfect fall cookie. Enjoy! Preheat oven to 350 degrees. In a mixing bowl whisk together flour, oats, baking soda, salt, cinnamon, nutmeg and ginger for 30 seconds, set aside. In the bowl of an electric stand mixer fitted with the paddle attachment, whip together butter, brown sugar and granulated sugar until creamy (occasionally stop and scrape down sides and bottom of bowl throughout entire mixing process). Blend in egg then blend in vanilla extract and pumpkin puree. With mixer set on low-speed, slowly add in dry ingredients and mix until combined. Mix in chocolate chips and pecans. Let batter rest 5 – 10 minutes (this just gives the oats some time to absorb the liquids so batter isn’t so sticky and cookies don’t spread so much). 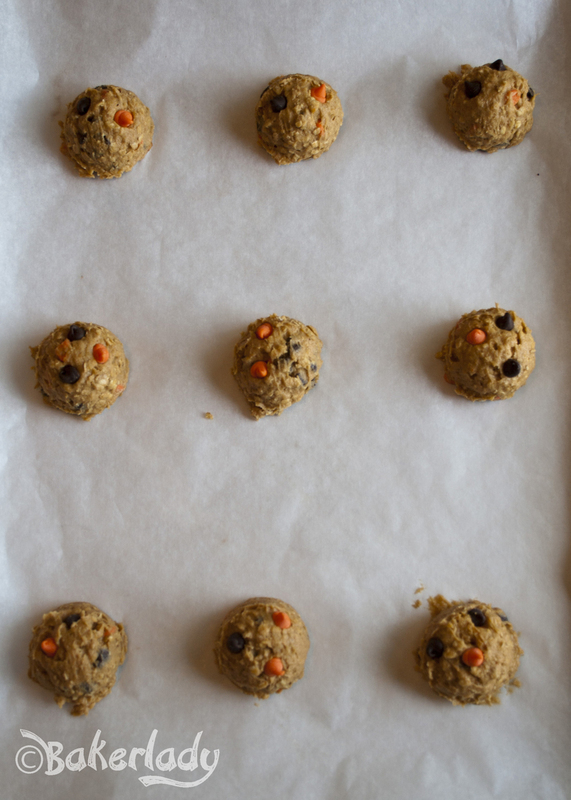 Scoop dough out 2 Tbsp at a time and drop onto Silpat or parchment paper lined baking sheets, spacing cookies 2-inches apart. Bake in preheated oven 12 – 14 minutes. Allow to cool on baking sheet several minutes then transfer to a wire rack to cool completely. Store in an airtight container. These look amazing! I’ve never used pumpkin in cooking but always reminds me of autumn. I went down the apple and cinnamon route instead but will definitely be giving this a go!